Here’s the thing, writing is such an easy thing to do when you are motivated and conversely a really tricky thing to accomplish when motivation is scarce. That pretty much sums up motivation, do I need to write any more on the topic? Of course, I do or my audience would diminish instantly. Ever changing levels of motivation create such an omnipresent dilemma in our daily lives that most people would pay to discover the secret of permanently being at our best. In my travels around the UK and beyond working with staff and students in schools , I am consistently faced with the same challenge, how do I motivate people to listen to me? Ironically teachers face the same challenge four, five and six times a day, how do I motivate students to listen to me? Even more ironically, how do headteachers motivate their staff to be better at their jobs? Seems to me that the whole world of education depends very much on the motivation levels of all its’ stakeholders. How precarious! 1. how relevant was it to your life and interests, my score was 10/10. Now how well you expected to do in that subject, ie your expectancy of success, again my score would have been 10/10 for French. So 10 x10 would have given me a motivation score of 100/100 – I was a highly motivated French student. How about you? What’s your score? Try it out below! It is exactly the same by the way for every member of staff who swap classes and groups five times a day in high schools or for Primary and Elementary schoolteachers who have to teach five or six subjects and topics in one day to the same class. Teacher’s motivation goes up and down every lesson depending on who and what they are teaching based on how well they know the topic, how interested they are in it, but most importantly how well they perceive they will succeed with that particular group of students. Students would be able to identify and articulate why they didn’t feel motivated, i.e revealing a lack of belief in why they feel they can’t succeed; why the topic doesn’t feel relevant to them or why they don’t like a particular teacher. In a school with high values, morals and ethics, these conversations and this level of transparency would lead to improved lesson planning, teachers taking more risks, improved relationships and a much more relevant curriculum. 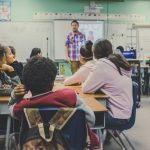 Making these critical observations and having these crucial conversations would also allow the school community to teach and engage some of the strongest models of education which, have thus far been largely ignored by the state school system. Howard Gardner’s work on Multiple Intelligences, Daniel Goleman’s landmark text on E.Q. incorporating the role of the amygdala and finally Carole Dweck’s illuminating work on Mindset (see her video below), would all have a much more authentic platform on which to be built in a school.